It was a great weekend for stitching, visiting and snow of course. I just hope the snow doesn't stay for too long. The poor crocuses that were coming out are now frostbitten and don't look very happy in the snow. I have a busy few weeks ahead of me and am looking forward to Spring Break. I also hope we have better weather for Spring Break because my husband wants to go camping!! Crossing everything that it doesn't rain!! 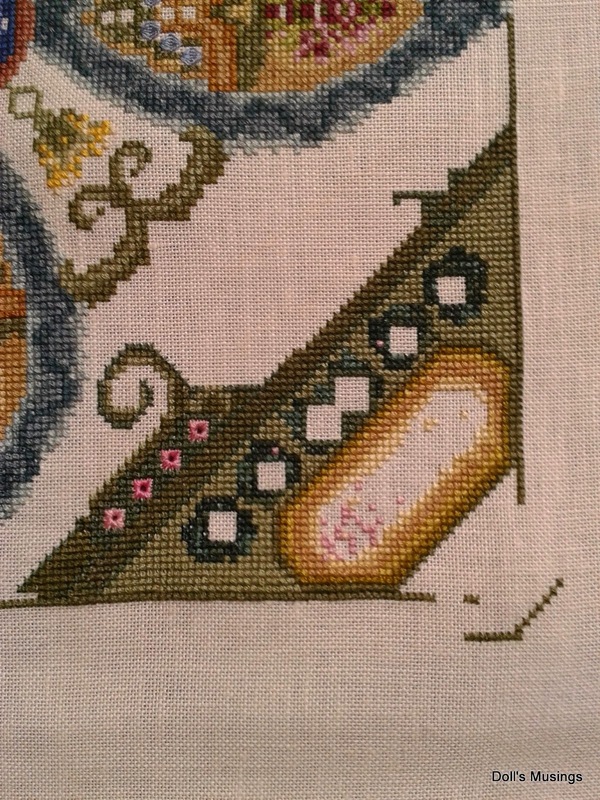 I stitched a bit on 3 WIP's. Magic Garden is getting lots of love. I took a photo on Saturday morning with a Stellar Jay feather I found on the street. I love Stellar Jays although they are very noisy and love to squawk right by our window!! Such pretty little birds aren't they?! Knotgarden received a bit of love last night. LHN's February is nearly complete. Funny how February is nearly over. I need to plan a wee bit better for those monthly designs. I filled in the heart with red. It isn't supposed to be stitched but it looked odd without the red heart! Until later, take care everyone and have a wonderful week!! Looks like great progress over the weekend! Well good for you! I am glad you got in a bit of relaxation/stitching time. Monthly designs defeat me, I start off thinking I'll keep up and never do. Knotgarden is so pretty with such amazing detail. 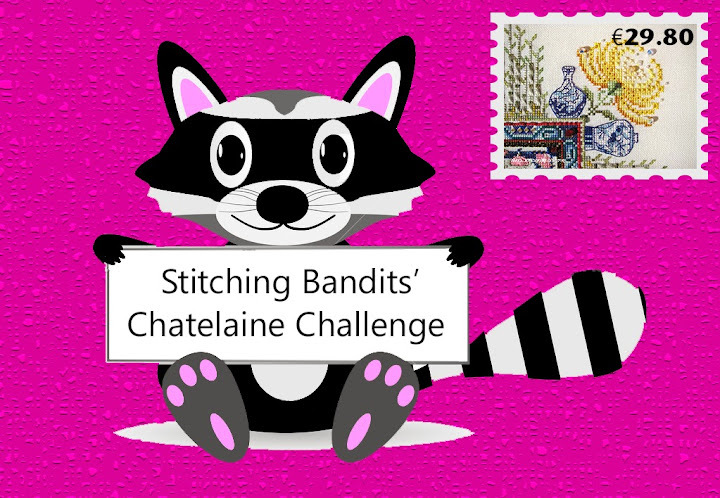 You are stitching some really lovely projects. The stellar jaw is a beautiful bird. And as noisy as the jay's we have here. You put your weekend to good use! 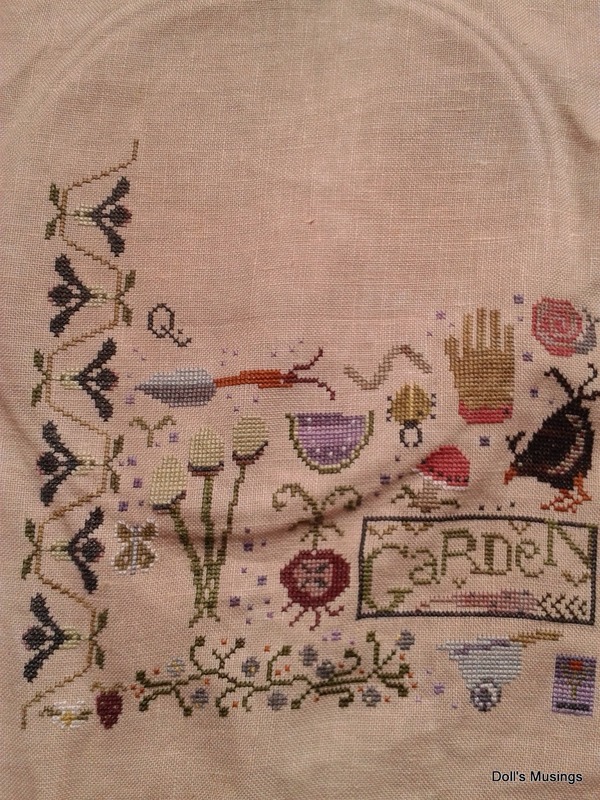 Magic Garden is one of those pieces I've thought about stitching for some time. And what a beautiful bird photo! Love his blue feathers. Beautiful stitching and what a pretty bird,I love the blue feathers. Knotgarden is beautiful! Looks like you made lots of progress on your IHSW. 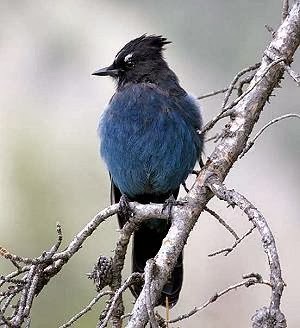 Love your Stellar's Jay photos. We don't have them around here--at least I've never seen one. All of your stitching looks great! You accomplished a lot! We don't have Stellar Jays around here. Just Blue Jays. Camping on Spring Break, huh? It must be a whole lot warmer where you are than where we are. lol! Great progress on your stitching! All the stitching looks lovely! I hope you do get to go camping!! That means spring is really here! Lovely projects and beautiful photos! Great post Anne and I love that bad tempered turnip in your garden .He does look rather cross. Everytime I see yours I think I really must get round to stitching mine. I loved all your red pieces last time too.Look forward to your next post. Hugs from here in the UK. Keeping my fingers crossed for your camping trip! Your WIPs are beautiful. So detailed. I found your blog through Jo's and look forward to following you. Lovely WIPs, & what a cool bird! The Stellar Jay is very pretty but if it sounds like a Blue Jay then I can understand not wanting it outside your window :) Lovely stitching! Your WIPs a re looking great - Knotgarden is just so pretty. You did have a good stitch weekend, nice progress on them all. Nice progress on your wips!! Great progress on your wips, Anne! You really stayed on course. Love Knotgarden and your progress on the Magic Garden. Those hearts are super cute too. Love your bluejay photos...they have so much character and are so pretty! 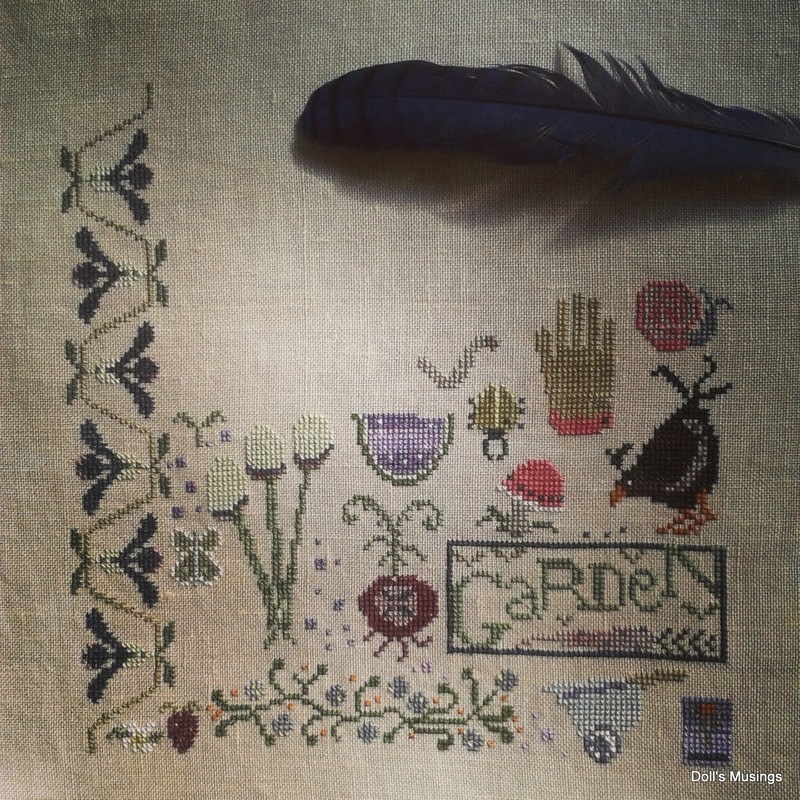 You are stitching some really lovely projects, and your bluejay fotos are great! Knot Garden is a stunner, so pretty. 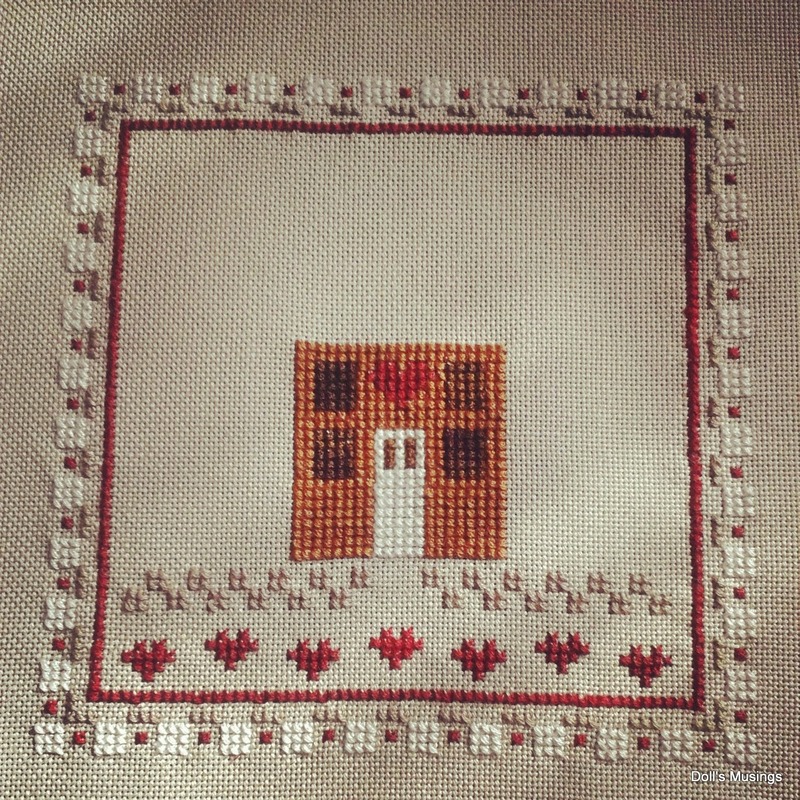 Wonderful progress on your stitched pieces. What a pretty bird--we don't have them around here. And they're blue--you know how I love anything blue!! your wips are all so pretty and love the birdie pic,really pretty!!! 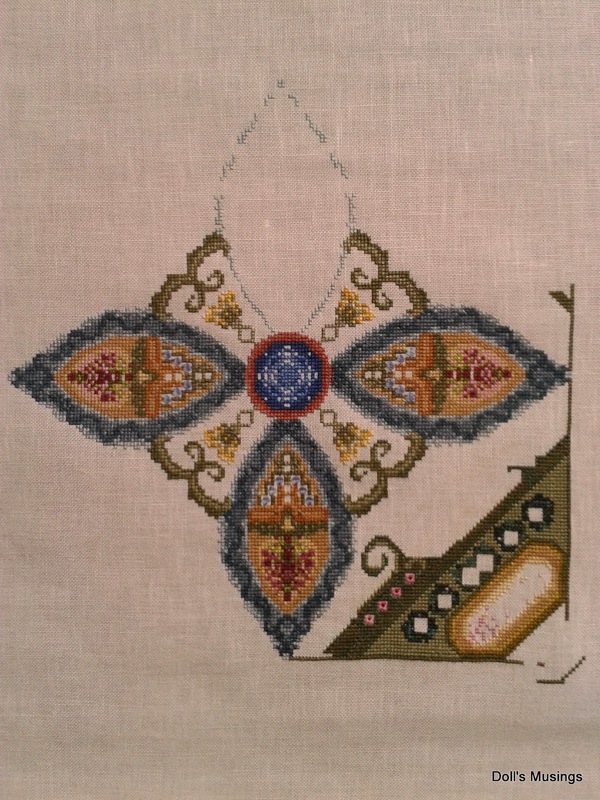 Lovely work on your stitching! You were stitching up a storm that last weekend. And look at all the great progress on your WIPs. Very impressive. And it's a nice feeling of achievement that one has after such a stitchy weekend. Great progress on all your pieces, it must be nice to be working on garden pieces when the weather is so cold and wintery. The end of February sneaked up on me too, I could have done with an extra day or two! Hi, Anne! I saw your blog via RAK group. It's lovely and look forward to following you. I've never seen such a bird, it mustn't live around here, it's very beautiful ! you've done a very great progress on your pieces, they all are so beautiful !